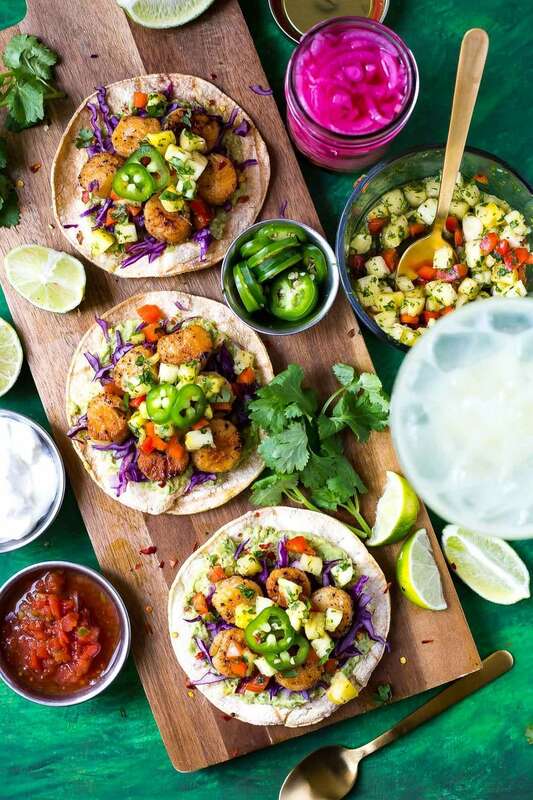 These spicy Seared Scallop Tacos with a savoury cilantro-filled Pineapple Salsa and served on corn tortillas are the perfect party food for Cinco de Mayo - with a twist! Preheat oven to 350 F. Heat corn tortillas for 5-10 minutes to either heat or toast them. Get all toppings ready for tacos. Make guacamole by mashing avocados and mixing all ingredients together. Mix pineapple salsa ingredients together and set aside. Remove scallops from heat onto a paper-towel lined plate. Spread each tortilla with a bit of guacamole, then top with red cabbage, scallops, pineapple salsa and other toppings. Serve and enjoy!